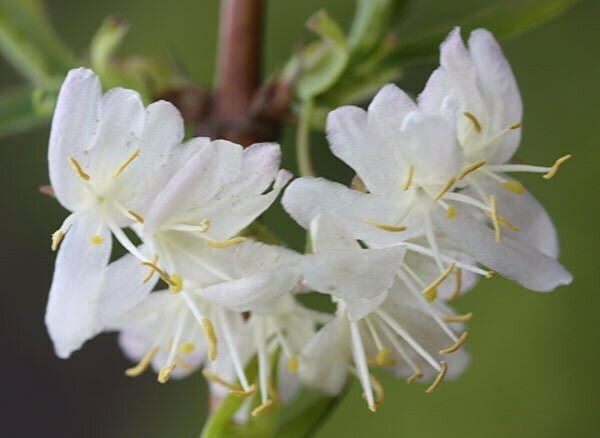 Clusters of white, tubular flowers with prominent yellow anthers cling to bare branches in the depths or winter and fill the air with a heady fragrance. The scent from this deciduous or semi-evergreen shrub will stop you in your tracks. An invaluable addition to the garden in winter, it is best planted near a path or in a front garden, where its delicious fragrance can be appreciated. Once the bright green leaves appear, this honeysuckle looks rather insignificant, so plant it among shrubs that provide interest over the summer months. Really lovely plant. Grows well on a north facing wall with not much sun, especially in winter. I LOVE these! They have the most delicate little flowers - graceful and understated. The plants grow well, and after a few years need a tame or two. In the right spot, new shoots often get to 3ft by pruning time! For me they are the unsung heroines of a winter garden. Delicate flowers when all else is bare or evergreen. They are also wonderful for the early bees and butterflies. Cannot recommend enough. This plant doesn't seem to have thrived in my garden, it might be the position, it hasn't grown very much.